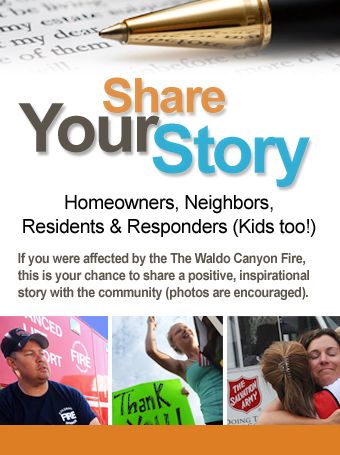 Do you have a positive, uplifting or inspirational story to share emerging from the tragedy of the Waldo Canyon Fire? Please share it with us. I certify that the story and photos provided are my own. Please only share stories if they are yours, or of you have the permission to share the story. Feel free to upload images, but please limit them to 50MB. Please only share photos of property and individuals who have given permission for you to share their image. If you have additional images or would like to share a video, please contact cst@coloradospringstogether.org. Colorado Springs Together reserves the right to edit stories for length or content. Based on the number of submissions, there is no guarantee your story will be posted on the Colorado Springs Together website or Facebook page.